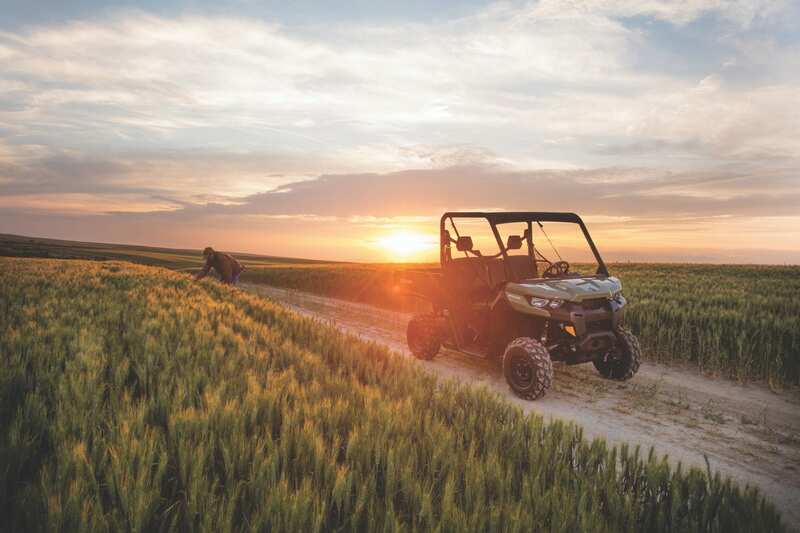 The new tough, capable and clever Can-Am Defender HD5 side-by-side vehicle brings superior cargo and payload capacity and great value to the Can-Am lineup. 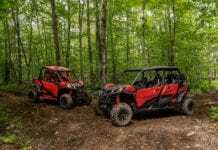 The new 2017 Can-Am Defender HD5 side-by-side vehicle brings a new mid-size engine, two handy packages and exceptional value to the tough, capable and clever Defender family of utility-recreation vehicles. Starting at just $9,999 (USD), the Defender HD5, utilizing the same chassis as its larger-displacement family members (see: 2017 Can-Am Off-Road Lineup), was engineered to outperform its competition in serious working environments like farming, ranching, construction and hunting. 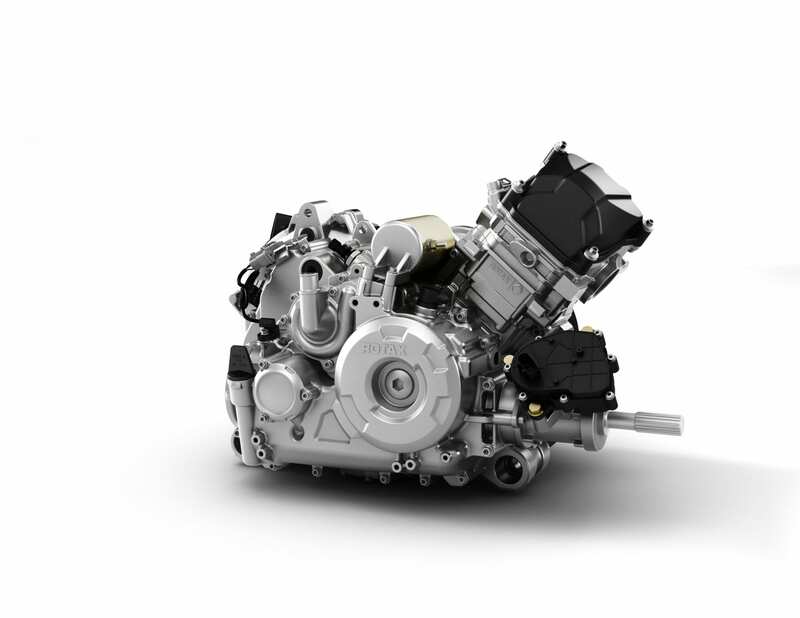 An all-new, heavy-duty, 38-hp HD5 Rotax single-cylinder four-stroke engine delivers outstanding performance. The liquid-cooled engine is mated to a CVT transmission with standard engine braking and TTA-HD rear suspension, giving the Defender side-by-side vehicles enough muscle and predictable stability to conquer nearly any task. The unit is built tough with a sturdy, high-strength chassis combined with exceptional towing, hauling and payload capacities. No break-in requirements mean owners can focus on chores and have the confidence to take on difficult tasks and challenging trails. 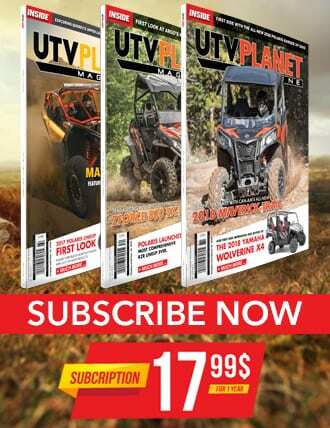 Selectable 2WD / 4WD with Visco-Lok auto-locking front differential provides great traction, while a long 83-inch (211.5 cm) wheelbase offer superior handling for hard work and trail riding. Dynamic Power Steering on the DPS HD5 package further enhances the driving experience. All Defender vehicles are built with clever and adaptable solutions to work smarter. 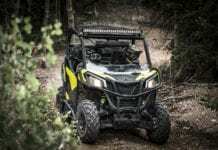 The profiled cage and versatile-and-tough cargo box deliver seamless integration with genuine Can-Am accessories. The Defender family of vehicles offers a spacious, comfortable and intuitive cockpit that has been configured to improve entry / exit as well as sight lines. VERSA-PRO bench seat featuring a 40/20/40 profiled bench seat for three adults as well as plenty of modularity. The work-ready Rotax HD5 single-cylinder engine delivers 38 horsepower for tough chores. The 427cc engine is located in the rear of the Defender chassis to reduce noise, vibration and cockpit heat while also improving access and reducing vibration. The Rotax HD5 engine has been calibrated to supply excellent power and torque for work on the farm and in the field. The Defender HD5 side-by-side vehicles come standard with Park, Reverse, Neutral, High and Low ranges. Integrated hill descent control supplies smooth, predictable deceleration. Electronic Drive Belt Protection monitors the CVT belt to determine its condition and alerting the driver to be in low gear. A helical gear transmission provides a quiet environment for the operator. With zero break-in maintenance required and a yearly maintenance schedule, the Defender side-by-side vehicles reduce total maintenance costs to the buyer. The yearly advised maintenance is 1,865 miles (3,000 km) or 200 hours. Along with reduced maintenance, the engine and transmission are more do-it-yourself service friendly, offering easier access to key maintenance items. 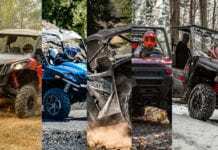 Can-Am engineers, gathering insights and feedback from end-users, created a convenient platform for service, improving access to components with a special focus on Do-It-Yourself and ease of maintenance. A Service Center is located beneath the front hood with easy access to brake fluid container, toolkit, fuse box and diagnostic connector. At the rear-end, critical elements such as engine bay, oil dipstick, air filter, CVT, transmission and coolant are also easily reachable thanks to the wide opening-box possibility. Other critical parts such as the battery, bushings, drainage and cleaning holes and lighting bulbs have been also strategically positioned for a quick-access. The Defender is extremely capable off-road and a legitimate workhorse that uses a high-precision chassis and automotive-like technology and fabrication tolerances that are in line with modern pick-up trucks. The High-Strength, Low-Alloy (HSLA) grade steel means a more rigid design for taking the strain of heavy-duty chores. Can-Am engineers put the Defender through the new rigorous utility test cycle at the winter and summer testing grounds to ensure its toughness. This package provides a very capable 500-W output magneto, for handling high-powered lighting and other key accessories. The integrated central front steel bumper offers protection for the front end, yet is minimalistic in its appearance. A full-length, central skid plate lines the underside on the Defender vehicles to protect your vehicle from the asperity of the ground. 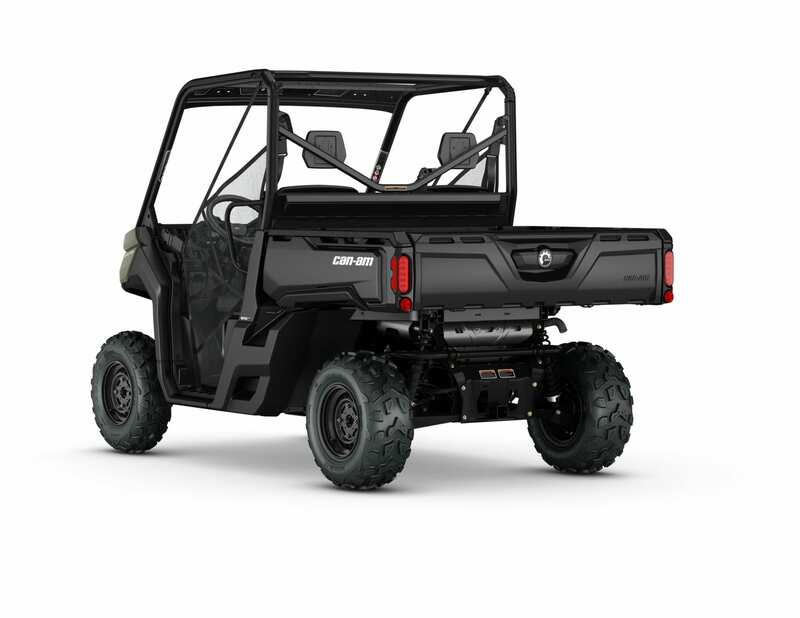 The Can-Am Visco-Lok system, calibrated for use in the Defender side-by-side vehicle, is one of the most driver friendly designs on the market. The progressively and automatically locking front differential system requires no extra buttons to push or levers to hold. Once 4×4 is selected, the system intelligently transfers power from the slipping front wheel to the opposing wheel with traction and is not hampered by a speed or rev limiters. Users, via an in-dash toggle switch, can select between 2WD for casual drives and 4WD for maximum traction for heavy loads and more difficult terrain. 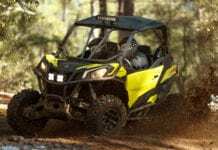 The Can-Am HD5 side-by-side vehicle also has a 10.5-inch (26.7-cm) ground clearance, selectable 2WD / 4WD Visco-Lok auto-locking front differential and 25-in. (63.5-cm) Maxxis tires on 12-in. (30.5cm) wheels for superior off-road capabilities. The Defender side-by-side vehicles have a front double A-Arm suspension system designed to offer predictable handling and control even in difficult terrain. With 10 inches of travel, the ride is smooth in all situations, even when carrying heavy loads. 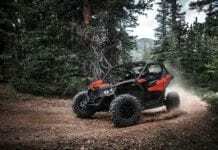 The Torsional Trailing A-arms (TTA) rear suspension, which was designed specifically for a utility and recreational usage, offers a full 10 inches of travel to provide a smooth ride whatever the terrain. Its architecture offers optimal comfort and drivability in all conditions, thanks to virtually no camber change. The Defender vehicle’s TTA-HD wears more bushings than some competitive units and is also larger and greaseable on both the chassis and knuckle, resulting in a more durable setup. In addition, the TTA-HD features a wear plate between the suspension and the chassis, preventing direct friction between those two. The durable system controls wheel movement when driving and also includes a removable external sway bar to enhance traction and the transfer of power to the ground when needed. The Defender side-by-side vehicles offer 10.5 inches (26.7 cm) of ground clearance for maximum performance for conquering difficult terrain or carrying a maximum load. The front 25 x 8-12 and rear 25 x 10-12 Maxxis tires are mounted on 12-inch black steel wheels. The Defender side-by-side vehicle uses dual 220 mm ventilated discs brakes with hydraulic twin-piston calipers up front and single 220 mm ventilated discs brake with hydraulic twin-piston calipers in the rear for excellent stopping force when pulling heavy loads. For a superb wide-visibility, two 35-W reflectors on each side run at 140 watts on high beam to provide superior lighting for early-morning scouting trips, trail rides or late-night farm chores. Taillights are LED for enhanced visibility in all conditions and confer a new level of refinement. The Defender side-by-side vehicles have a tight 14.5 feet (442 cm) turning to allow for easy maneuverability in restricted work environments, hauling heavy loads and for recreational use. The 44 / 56 weight distribution ensures a strong footing whatever the nature of the ride or the landscape. Handling serious chores is easy thanks to the Defender side-by-side vehicle’s strong Rotax engine and exceptional towing, hauling and payload capacities. The Defender is rated to tow up to 1,500 pounds (680 kg), haul up to 600 pounds (272.2 kg) in its large cargo box and has a 1,200-pound (544 kg) payload. A 2-inch (5.08 cm) hitch receiver equipped all Defenders. The standard size allows a hitch to be transferred directly from a typical pick-up truck. Combined with an industry-leading 10.6-gallon (40 L) fuel tank and excellent fuel efficiency, the Defender side-by-side vehicles provide maximum range for both serious work and recreation. The highly durable Cargo box has a 600-pound (272.2 kg) load capacity and dump assist levers on both sides. It also features a versatile configuration that can create a customizable dual-level setup or completely separate compartments. Strategic features include 5-gallon (18.9 L) pail recesses, integrated anchors on the sidewalls and several tie-down points for added convenience. To fully optimize the large cargo box, consumers can divide it up using the integrated recesses. The box allows for both 1×3 (inch) and plywood separators and accepts bed extenders for refining the bed’s overall dimensions. The cargo box is adaptable to accept 14 LinQ quick-attach accessories for further customization. The heavy-duty cargo box has intuitive adaptability to go with its 600 lbs. (272 kg) rated capacity, tilting bed and fully functional tailgate. The open dash configuration is designed to be more functionally friendly with more accessible onboard storage, by reducing overall hood space. The Defender HD5 side-by-side vehicle supplies a total of 3.1 gallons (11.7 L) of storage solutions. The storage includes an under dash area with an enclosed pocket (0.4 gal. / 1.3 L), 1.8-gal. (6.9 L) dash compartment and an armrest with cup holders (0.9 gal. / 3.5 L). The VERSA-PRO Bench Seat, uses a 40/20/40 bench seat design inspired by modern pick-up trucks. It can comfortably accommodate three adults and features “profiled” corners to improve entrance / exit of the cab as well as a sturdy vinyl cover for improved wear resistance. The passenger seats, complete with integrated hooks on their underside, also can be flipped up to improve onboard storage. Can-Am engineers also added a foldable central console and armrest with two cup holders to allow more space in the cab. The Defender offers a spacious cockpit with unmatched fit-and-finish. Engineers optimized the interior ergonomics for a wide range of people. Tilt steering, improved sight lines, enhanced storage and overall cockpit volume improve comfort and convenience. The A-pillar was moved far forward to provide almost effortless ingress-egress and to enhance visibility for all the occupants. More interior cabin and dash space, rather than overall exterior hood size, creates a more spacious interior for the owner. The steering wheel was specifically designed for utility applications with a larger diameter for improved handling and control. The automotive-like tilt steering wheel lets drivers adjust (up to 25 degrees) it to their driving style and ergonomic preference. It offers also an easier maneuvering while entering/exiting the vehicle. The location of the gauge is strategically positioned in front of the driver to increase the readability of the information provided. The LCD gauge display key information; speedometer, tachometer, odometer, trip and hour meters, fuel, gear position, seat belt and 4×4 indicator, diagnostics, clock, auto shut off. The new Can-Am Defender has four, in-cab, easily accessible cup holders. Two are located in the dash area and two additional cup holders are located in the central armrest. Four cup recesses were also incorporated into the cargo box tailgate for added convenience. The profiled cage means it provides a “flush fit” when quickly incorporating the extensive list of Can-Am cabin accessories. The sturdy Profile cage (steel) meets Roll-over Protective Structures (ROPS) industry standards and is certified ISO 3471 and OSHA. 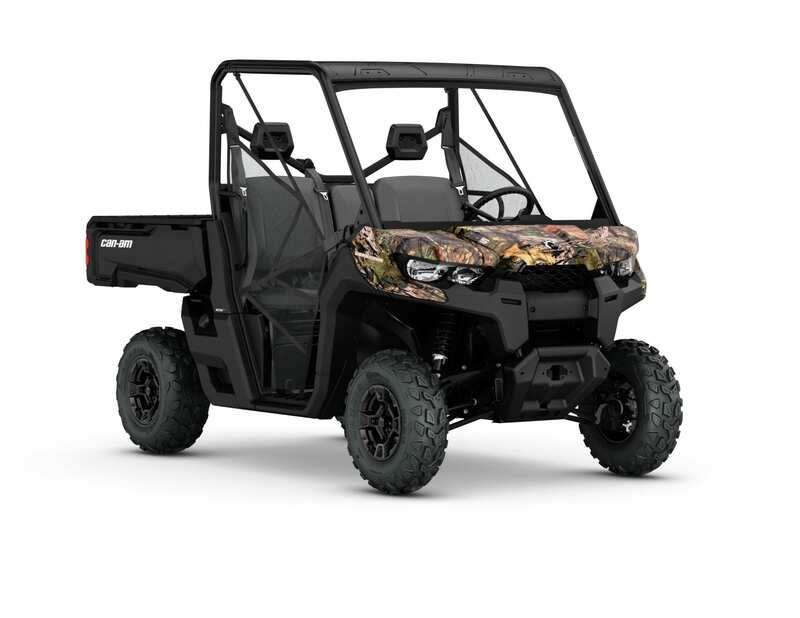 It is designed in tandem with the Can-Am Cabin and genuine accessories to ensure the best fit-and-finish and seamless integration in the industry. The Defender HD5 side-by-side vehicle is available in Green. The Defender DPS HD5 side-by-side vehicle has many of the key Defender family features, but also includes upgrades like segment-specific Dynamic Power Steering, Visco-Lok QE, 12-inch cast-aluminum wheels, additional storage and a premium color choices. The specific DPS system is tuned for utility applications while also offering responsiveness for recreational usage. DPS improves steering feel in slow-speed working situations and in more technical terrain. It is also designed to offer less assistance at high speed and more assistance at low speed. The Visco-Lok QE (quick engagement) calibration supplies an even faster engagement of the front differential, which can lock up to 100% with no rev or speed limiter. 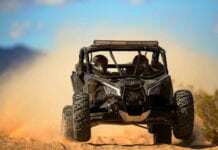 The DPS package includes 12-inch (30.5 cm) cast-aluminum wheels with 25-inch (63.5 cm) Maxxis tires. 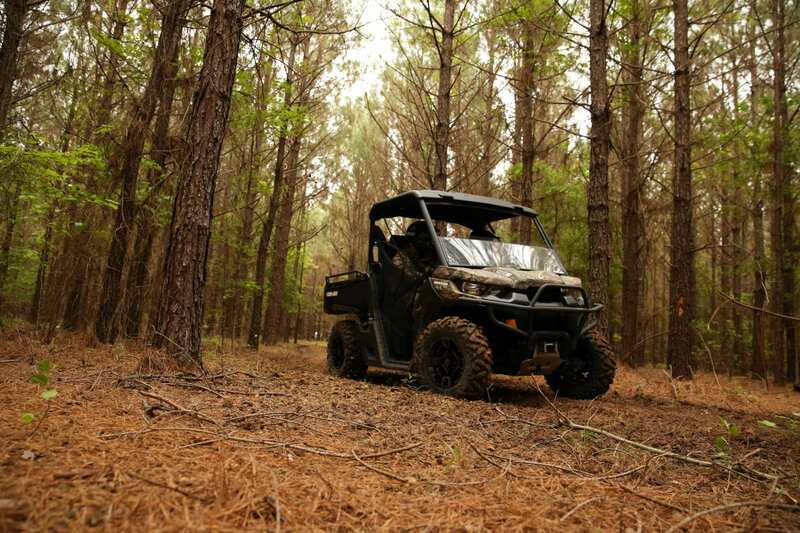 The Mossy Oak® Break-Up® Country™ Camo color includes 12-inch black aluminum wheels. The Defender DPS HD5 offers the same open dash configuration as the base model, but has more onboard storage space at 10.4 gal (39.5 L). Its larger under dash storage space (6 gal. / 22.8 L) and industry-exclusive and water-resistant, removable toolbox with 1.7 gal. (6.3 L) of portable storage provide additional versatility.